Netflix and Marvel Television have released a new teaser power for Marvel's Daredevil Season Three. 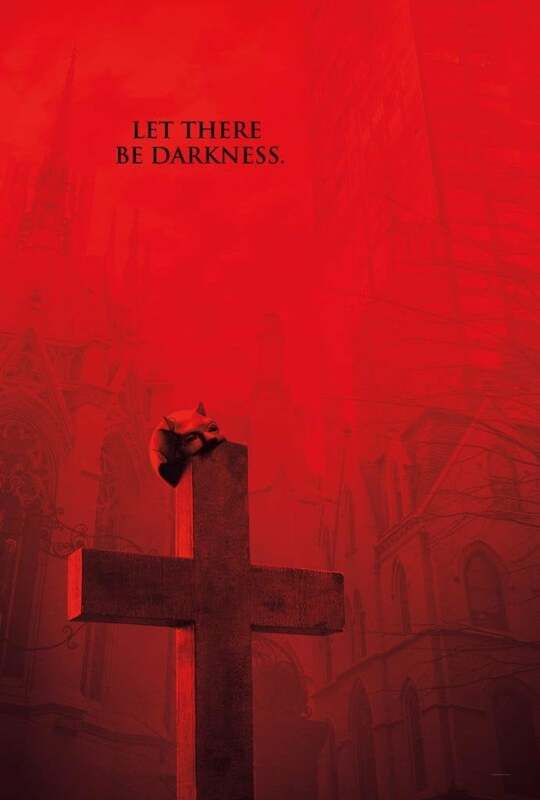 The poster shows Daredevil's mask hanging from a cross. The image invokes Matt Murdock's Catholic faith, a defining characteristic of the Marvel vigilante, especially in the "Born Again" storyline that season three is said to be inspired by. The religious imagery in the teaser fits with how the Daredevil Twitter account has been cryptically tweeting out Bible verses. This poster was accompanied by a citation of Job 30:35, which reads, "But when I hoped for good, evil came; when I looked for light, darkness came." Erik Oleson takes over as the showrunner for Marvel’s Daredevil Season Three. Stars Charlie Cox, Elden Henson, and Deborah Ann Woll each return in their respective roles as Matt Murdock, Foggy Nelson, and Karen Page. Vincent D’Onofrio will also return to the role of Wilson Fisk, the Kingpin who was the primary antagonist of the show’s first season. Cox has had nothing but high praise for D'Onofrio's performance. "Vincent D'Onofrio is a tour de force, huh? I don't know if could say enough good things about him," said Cox previously. "What's great about Vincent — I always think of the scenes I have with him as requiring very little acting on my part. Because he's so scary as Wilson Fisk, and he's so big, I just know if I learn my lines, when I say them, it's likely to work. Because so much of the acting is done for you just because of what he brings for you to a scene." Cox has also teased a new hallway fight scene to top the highly-praised fight scene in the first season. "The one thing that I am excited about is that we do have a scene in the show that is an homage to the corridor scene from Series One," Cox said. "I'm very excited about the fans to see that." Marvel’s Daredevil Season 3 began filming in November 2017. The series will pick up after the events of Marvel’s The Defenders. Daredevil’s allies believe he died fighting Elektra when the Hand’s building collapsed, but audiences know he survived and was brought to a convent. What do you think of Marvel's Daredevil Season Three poster? Let us know in the comments. Marvel's Daredevil Season Three still doesn't have a specific release date but will arrive on Netflix before the end of the year.